The Sun Blade x6275 M2 is a dual-node, dual-socket blade. That is basically two double-socket blades within the footprint of one blade. With the six-core Xeons, that equates to 24 cores per blade, or 240 in Oracle-Sun’s 10U, 10-blade chassis. Why not just build a four-socket blade? “The virtualized environments we are targeting are using smaller types of workloads that don’t need access to four sockets at once,” said Dimitrios Dovas, director of product management for blades, x86 servers and networking at Oracle. There’s no evidence as far as I know that two-socket servers are better at virtualized workloads (in fact the evidence points the other way). So I’m not entirely sure why Oracle-Sun wouldn’t just build a four-socket Intel blade here. Perhaps it’s cheaper to make two dual-socket blades crammed into one than it is to make a four-socket blade, but Oracle can still try to market it as being equivalent to a four-socket blade and charge a premium. Gartner: Oracle only major server vendor to see drop in revenue, but who cares? It’s important to realize that Oracle hasn’t even owned Sun Microsystems for a year yet, so perhaps it is unfair at the moment to harp on Oracle for revenue mostly related to Sun. At the same time, Oracle has been pushing its Exadata Version 2 platform for over a year now. Apparently that hasn’t yet translated into enough sales to actually improve the company’s server revenue. I’m not sure Oracle cares about this, though. Oracle is concerned more with profit margins than with overall server revenue. I’m sure Oracle execs will let HP and Dell sell their billions of dollars worth of pizza-box x86 servers with tiny profit margins, while they rake in the dough with sales on Exadata and big box Unix servers, where profit margin is much larger. Is Oracle Tutor worth the premium over Microsoft Word? Some might ask what the difference is between Oracle Tutor, its process and procedure documentation software, and a simple program like Microsoft Word. In other words, why use Tutor to write a company handbook when you can just do it in Word? Earlier this month, Oracle rolled out Tutor 14, its latest iteration of the product, which has been around for more than a decade. New features include integration with Oracle’s own Business Process Management software, Microsoft’s Visio flowcharting tool and other XML Process Definition Language (XPDL) formatted tools. I talked to Deb Piper, senior documentation and training specialist at one of the world’s largest steel producers ThyssenKrupp, about the company’s use of Tutor. What about Tutor vs. Microsoft Word? “Tutor is like Word on steroids,” she said. My guess is that large companies are more likely to use a product like Oracle Tutor to keep track of all the documentation within their company. Smaller companies are more likely to be able to get away with not shelling out the dough to get it, and continuing to use Word or some other simpler, cheaper software for documentation. As Oracle vs. SAP battle dies down, could Oracle vs. HP battle heat up? While there’s a good chance that Oracle will emerge the winner in the Oracle vs. SAP trial that’s finally nearing its conclusion, the software giant might not be as lucky when it comes to another vendor battle — Oracle vs. HP. First of all, Larry Ellison’s attempts to subpoena Leo Apotheker — even going as far as to hire private eyes to track down the HP CEO — have ultimately failed. Ellison’s lawsuit is now in the hands of a jury, and Apotheker managed to stay away from the courtroom while on a supposed world tour visiting with HP employees and customers. The success of HP’s earnings call extends far beyond Apotheker’s comments. Not only did the company outperform expectations and become more profitable and gain market share, but it gained market share in its most profitable segments, according to an article in Barron’s. Apotheker praised HP, noting that a “competitor” has been unsuccessful in its attempts to distract the company. Reports have also surfaced today that HP is dropping Oracle Siebel for Salesforce.com as its internal CRM provider. This would be a huge loss to Oracle, since if the deal goes through, HP would replace 35,000 to 40,000 seats of Oracle Siebel with Salesforce.com. Trip Chowdhry, an analyst at Global Equities Research, has said that Oracle is “very furious” after hearing this news. As HP becomes more of a threat to Ellison and Oracle, how much longer will the Oracle-HP alliance be able to survive? Oracle is currently going head to head with SAP in the courtroom over its competitor’s alleged intellectual property theft. And while the high-profile case may be nearing a long-awaited conclusion, it seems like the end of this trial is not going to mean the end of all legal issues for the software giant. The Service Industry Association, a group made up of about 130 hardware maintenance providers, is calling Oracle’s hardware maintenance policies anticompetitive and has filed an appeal with the U.S. Department of Justice (DOJ). The DOJ gave Oracle the green light for the Oracle Sun acquisition last year, and the European Commission approved the deal in January after assuring that fair competition would be preserved in the market. But the SIA has a different view. It claims that Oracle is abusing its dominant market position with its new hardware maintenance policies, especially in regards to the $2.4 million of Sun maintenance business contracted to Independent Service Organizations (ISOs). ISOs are now prevented from servicing the hardware break-fix needs of its Sun hardware customers, it claims. Oracle restricts access to its operating systems only to those users with existing hardware maintenance contracts. Oracle has enacted “Return to Oracle” service restoration fees for those who use an ISO but then later return to Oracle support. Those using ISOs cannot split their service requirements between the ISO and Oracle, and Oracle will not support any of an ISO customer’s Sun hardware. In other news, Oracle has filed a lawsuit of its own against a hardware partner, Multis. Multis had a contract with Sun Microsystems when Oracle purchased Sun, and its contract involved services related to remanufacturing Sun technology, such as product refurbishing and distribution. Multis has had three burglaries at one of its warehouses since July 2009, and now Oracle is seeking damages of at least $328,742. The software giant is claiming its partner did not have insurance to cover the losses from the thefts, and according to their contract, Multis is liable for the product losses and damages from the burglaries. Sun Microsystems support customers are on a verge of a big switch to My Oracle Support next month. The support migration will take place Dec. 10-12, and will include retiring Sun support Web tools such as SunSolve, Member Support Center and Goldstar. Sun support customers should already be well aware of the switch, and hopefully are prepared for the transition. How smoothly that transition goes from Oracle’s end will remain to be seen. Last year, Oracle support customers experienced problems when Oracle moved them all to its new portal, My Oracle Support, after the company retired the Classic Metalink. Complaints about My Oracle Support included a Flash interface that often wasn’t compatible, unhelpful tech support, and the inability to simply log into the portal. And that was for existing Oracle support customers just moving to a different support platform. Does anyone think that Sun support customers migrating over will happen without any glitches? The Oracle vs. SAP lawsuit is now underway, and Larry Ellison has already taken the stand in the courtroom, testifying in the case that alleges theft of Oracle’s intellectual property by SAP. But the one person who Ellison wants to see take the stand — former SAP CEO Leo Apotheker — is nowhere to be found. Oracle has issued a subpoena for Apotheker, who is now the CEO of HP. But HP has refused to accept the subpoena, claiming that Ellison is only doing this to discredit HP as a competitor and that the software giant had plenty of chances to question Apotheker when he still worked at HP. But as the latest development in the search for Apotheker emerges, we learn that there may actually be no exaggeration here. Ellison has hired a private eye to find the HP CEO, numerous sources have reported. Oracle Corp. today submitted its proposed API for a cloud computing interface standard, something the Distributed Management Task Force is working on building. Rex Wang, vice president of product marketing at Oracle, said the proposal is Oracle’s way of getting its input into a future cloud computing interoperability standard. Wang explained that Oracle’s proposal is called the Oracle Cloud Resource API. According to him, the API consists of two main pieces. The first piece is a resource model that defines the relationship between components in a cloud computing environment; for example, the relationship between a virtual machine image, the application running on top of it, and the networking infrastructure running underneath it. The second is that the API is based on the Representational State Transfer (REST), a common architecture among web developers. The DMTF is an industry organization that develops standards for systems management in IT computing environments. Last year it started an Open Cloud Standards Incubator in the hope of developing a common cloud computing interoperability standard. Aside from Oracle, other major players in DMTF include HP, IBM, Dell, Microsoft and Intel. Genghis Khan once said, “It is not sufficient that I succeed — all others must fail.” And so it is with Oracle CEO Larry Ellison and his most recent statement regarding the upcoming Oracle vs. SAP trial. It appears that Oracle and Ellison are using the trial as an opportunity to drag HP and SAP, two of its biggest competitors, through the mud. Ellison has been said to have paraphrased Khan’s quote, and it is fitting. Ellison is a ruthless corporate competitor. 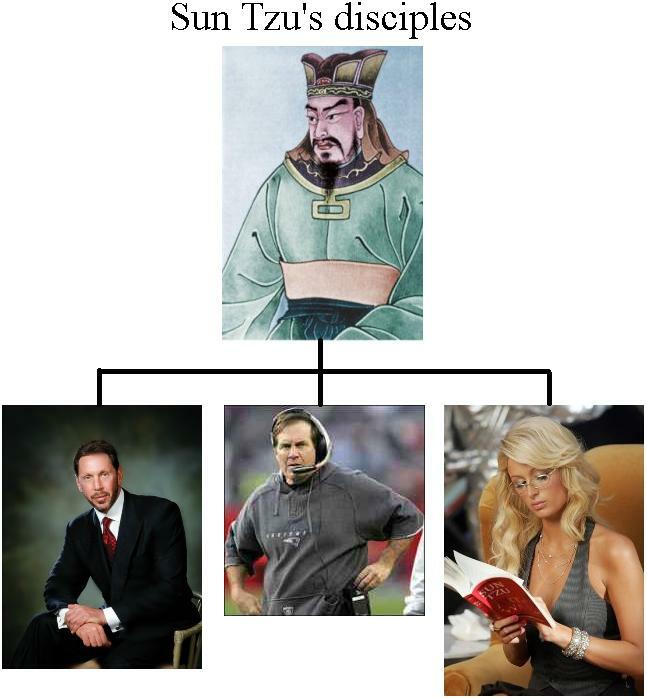 He is well known to be steeped in ancient Japanese (and overall Asian) culture, and in particular, is a fan of Sun Tzu’s “The Art of War.” That book has become popular among businessmen, football coaches, and even American heiresses. In other words, people who have no idea what real war is like. I mean, do you think Sun Tzu would really be pleased with this tree of followers? “A few weeks ago I accused HP’s new CEO, Leo Apotheker, of overseeing an industrial espionage scheme centering on the repeated theft of massive amounts of Oracle’s software. A major portion of this theft occurred while Mr. Apotheker was CEO of SAP. HP’s Chairman, Ray Lane, immediately came to Mr. Apotheker’s defense by writing a letter stating, ‘Oracle has been litigating this case for years and has never offered any evidence that Mr. Apotheker was involved.’ Well, that’s what we are planning to do during the trial that starts next Monday. Unless, Mr. Lane and the rest of the HP Board of Directors decide to keep their new CEO far, far away from HP Headquarters until that trial is over. If HP keeps Leo Apotheker far from HP headquarters we cannot subpoena him to testify at that trial. Wow. Essentially what Ellison is doing is trying to prevent HP from conducting business by threatening Apotheker with a subpoena. Talk about wanting not only to succeed, but to crush the competition. This also falls in line with “The Art of War” mantra that wars are won before they are fought. Ellison is trying to intimidate HP. Either Apotheker shows up to his job as CEO and gets dragged through a long trial, or he doesn’t show up and his perceived guilt in the case is assumed. It’s also worth noting that Oracle is not calling either Shai Agassi or Seth Ravin to testify. Agassi is the former president of the products and technology group at SAP who orchestrated the acquisition of TomorrowNow. Ravin ran TomorrowNow. You’d think Oracle might want to question two people instrumental in knowing whether the whole TomorrowNow business model was in fact illegal. I mean, isn’t that the basis for this whole trial? Or maybe, just maybe, this is one big circus, and Ellison is trying to be the ringmaster. Subtle? Larry Ellison? I don’t think so. Well, that didn’t take long. Former Oracle President Charles Phillips, who was unceremoniously dumped — um, sorry, he resigned, that’s right — from Oracle last month has found a CEO job at Infor, an enterprise software company for small and medium-size businesses (SMBs). Phillips was dropped in favor of Mark Hurd, the former CEO of HP and friend of Oracle CEO Larry Ellison. Phillips was credited with leading Oracle toward acquiring dozens of companies over the course of his seven-year tenure at Oracle, including the purchases of BEA Systems, Siebel, PeopleSoft and Sun Microsystems. Prior to Oracle, he was at Morgan Stanley and before that, he was a captain in the U.S. Marines. Phillips had something of a tumultuous end to his career at Oracle. In January, a billboard popped up in Times Square showing a picture of Phillips with his former mistress, YaVaughnie Wilkins. There were also billboards put up in San Francisco and Atlanta. They were put up by Wilkins, apparently to embarrass the married Phillips. Phillips admitted the affair. Then in July, Phillips claimed that Oracle could spend up to $70 billion in acquisitions over the next five years, or about double what it spent in the last five years. Oracle scrambled to take the message back, essentially rebuking Phillips publicly and saying the company doesn’t even have a five-year acquisition budget. Then HP dumped Hurd for expense report issues and deceit to the board. Ellison jumped at the chance to hire Hurd, and Phillips’ days were numbered. A blog for Oracle professionals with observations and commentary on the latest Oracle news and conferences, the Oracle database, applications, security, careers and certifications, Oracle vs. SAP, Software as a Service (SaaS), Oracle acquisitions, administration and more.